This website is provided by TECHNAL MIDDLE EAST, and may be used for information purposes only. All content included on this Site, such as text, graphics, trademarks, trade names, logos, button icons, images, audio clips, video clips, software, and their arrangement is the property of Hydro Extruded Solutions AS, its affiliates, related companies, its licensors or joint venture partners and is protected by Norwegian and international law. Unauthorized use or distribution of any materials on this Site may violate copyright, trademark, and/or other laws. Nothing contained on the Site shall be construed as granting any express or implied license or right to use Hydro Extruded Solutions AS, Norsk Hydro ASA’s or any other Hydro entity or third party’s intellectual property. Hydro Extruded Solutions AS authorizes you to view and download the information ("Materials") on this Site for your personal, non-commercial use only. This authorization is not a transfer of title in the Materials, and copies of the Materials may not be modified in any way or reproduced or publicly displayed or distributed or otherwise used for any public or commercial purpose. Hydro Extruded Solutions AS does not warrant the accuracy or completeness of the Materials or the reliability of any advice, opinion, statement of other information displayed through this Site. Neither does Hydro Extruded Solutions AS any of its subsidiaries accept any liability for any inaccuracies or omissions. Hydro Extruded Solutions AS does not warrant that this Site or its servers are free of viruses or other harmful components. For your convenience, Hydro Extruded Solutions AS may provide links on this Site to websites operated by other entities. Neither Hydro Extruded Solutions AS nor any of its subsidiaries are responsible for the content of any linked website and do not accept any liability in connection with access to and use of these websites. You are not registered? 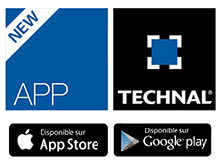 To benefit from Technal services, click on Subscribe.